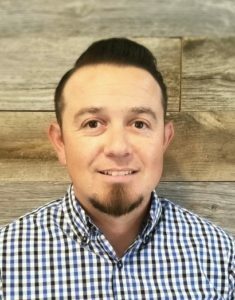 We are excited to share that David Torres is on board as our newest project manager. He will be leading jobs in all sectors of our portfolio from tenant improvement to ground-up, including restaurant, retail, office, metal buildings, and historic renovations. David earned his Bachelor of Science in Structural Engineering from Cal Poly Pomona in Pomona, California. He’s a pretty smart cookie. Since then, he’s been managing projects with excellence for 11 years. His approach to working with clients? “Be trustworthy, be persistent, lead by example, and trust the abilities of others,” he told us. We think that’s a pretty great strategy! David has bid, estimated and managed the gamut construction projects ranging from $25,000 to $15,000,000. Most notably, he bid and managed the historic renovation of an existing multi-story building that was originally built in 1888. The renovation included dropping the basement ten feet to allow for a future restaurant tenant, a complete structural retrofit and a new rooftop bar & events center. He also bid and managed a 25,000 square-foot, ground-up construction project for the Disney Archive Library—a new place to house and archive old Disney cartoon and movie reels. Other past projects include multiple projects at Disney Resorts, Pixar executive housing, Shell and Chevron gas stations, Discount Tire shops, full service restaurants, Lululemon Athletica yoga retail locations, multi-family mixed-use buildings, Wal-Marts, schools, churches and architecture offices. When he’s not busy working, you’ll find him spending time outdoors with his wife or hunting with his bird dogs Chester and Reba.